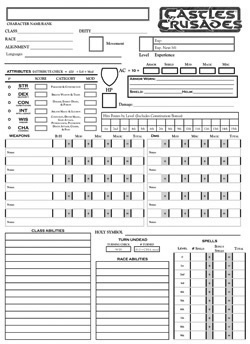 The Universal Character Sheet is a simplified two page character sheet, printed front and back, designed for use with all C&C classes. You can download this sheet in black and white for FREE here. The Universal Character Sheet covers everything you could possibly want for quick reference for your character, including a complete breakdown of weapons and their many to hit bonus; a place to list equipment with enough room to write it down; a place for spells, magic items and class abilities. Designed for use with the Character Record Folio.